During the recent years, practical problems on output regulation have been discussed theoretically in large quantities of literatures . Output regulation problems for discrete-time and continuous-time systems have been considered in  and , respectively. In , distributed output regulation of switching multi-agent systems subject to actuator saturation has been concerned. Experimental output regulation for a benchmark nonlinear system has been studied in . Robust and decentralized output regulation of switched nonlinear systems with switched internal model has been proposed in . 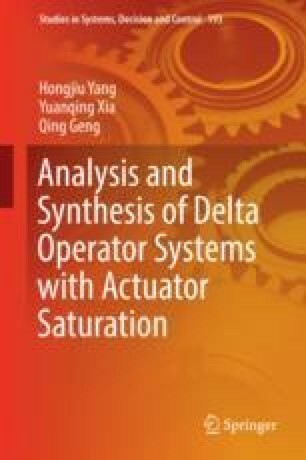 Output regulation for linear systems with actuator saturation in the full information case has been studied in . In , a generalized design scheme has been proposed for an output feedback regulation of a special type of systems with bounded inputs. In , a general formulation and solvability of global robust output regulation has been considered. An output regulation problem on switched discrete-time linear systems via dual design of error feedback and a switching law has also been concerned in . A class of problems on output regulation for linear systems subject to control constraint have been considered in . A robust output regulation problem has been presented for parameterized families of periodic systems . However, the output regulation problem for DOSs is still not completely researched, and there is still great space to explore this field.